"Margaret Ethel Bates, Westbrook College, Class of 1978"
Westbrook College student Margaret Ethel Bates, Class of 1978, was a Fashion Merchandising major and lived in McDougall Hall. 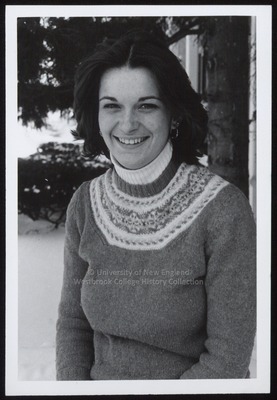 For her senior class candid photo, which appeared in the 1978 Tower Yearbook, she wore a crew neck, Fair Isle sweater with a white turtle neck jersey beneath. Her dark hair was shoulder length, parted in the middle and feathered back from her face. Margaret poses outdoors with snow and evergreens in the background.